#599 – Where’s My Pencil? for dverse, Brian Miller’s Pretzels & Bullfights wanted a poem about why we write. Me? It’s all about the bitching and the truth-blood-letting and the mental illness and the child abuse… and making it understandable for those who either have experienced it or need to understand. be sure to drop this in OLN tomorrow so it gets read…smiles. So many reasons to write…love yours. I too shed light on social injustice…One them I often write on is abuse. Loved it, especially the “pollock my journals” part. I’ve seen poems read in a rap-style and this reminded me of them. Hope you’re well! I am too! I recently came back. Sometimes us turtles just need time alone in our shells. Don’t worry about stopping by my page, I’m just glad to see your poems again. Peace. A powerful raison d’être, Amy, and you sure do fulfil it! I didn’t understand the word pollock (to me that is a kind of fish!) but loved “(my steel-sieve mind is known to fly)” which could be me talking! You present it all like it is. No mincing of words and none that is taboo. I like that Amy! They would have to accept it even if it is driven down their throats with all the bitterness. One man’s pill can be sweet or bitter that’s the whole point. And every one is vulnerable and subject to such onslaughts. Great write, Ma’am! … and you do a great job of it, Amy! 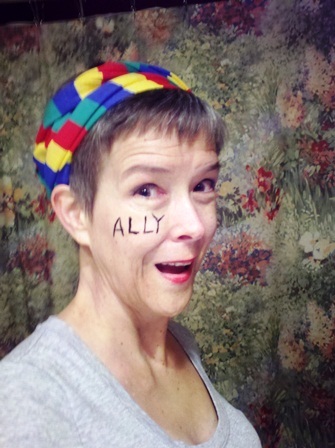 I’m an Ally as well…and this is straight up talk that I like to hear. Live or die on your heartfelt values. They talk about wearing emotions on sleeves…f*&% that, lets make some pant suits out of emotions and go to the party, when people ask us about the get up we just sing “candy colored clown they call the sandman” and leave it at that. Loved this a heap. ..and the lines Brian highlighted. You make the world a better place, Amy. GET> OUT > OF MY HEAD! That opening stanza is what comes from the voice in my brain everytime I write. and we use the same pencil. Tico #2s are the end all and be all. Love the picture. But the profound words spoke to me and through me. I love the passion in this poem, Amy. We are all the richer for your pouring of thoughts onto the page. Keep shining! Your words help light our way. I like the idea of writing to show you are here today. That is one of my reasons to write too. My presence is made known SOMEWHERE when I write. Other things may fade away, but my poem will stay. I also like the idea of draining your head through a Ticonderoga 2 pencil and the idea of pollocking your journal. Lots of good stuff in your poem today. Glad YOU are writing! And I love your writes just the way they are ! I love this! I’d love to hear you read it out loud. It made me smile, then feel weak in the knees, and when it was over I could imagine it might be possible to feel EVERYthing without it destroying you, to actually be happy. I love your energy. Love it. You are here today and strong. And I am so glad you write, no matter the reason why. You are a brilliant mind, light, woman. I just have to repeat what Brian said and everyone else too. I am an ally and a social justice storyteller, but I cannot not condense the why of it thee way you do here. This is a banner, a bio, a beauty! Love it. Yes you are… yes we are. Freedom in speech… love your pencil. I love this! It made me smile and it made me appreciate the words and colors I play with every day. And aren’t we glad to have you around, dear Amy. Keep that pencil sharp – very sharp, so as to match your mind. That was just so refreshing… Nice one…! right on, huzzah, and thank you! congratulations on kicking depression and on your real engagement with the mayhem of the world. words scrawled on urinals? wow, that’s some inspiration!! i like pouring it out with my ticondoraga. I don’t know where to start. This is fabulous, Amy. from `pollock my journals’ to `social injustice feeds my need’. This is a winner!